A Stanford experiment found that low-income high schoolers who rechannel their "negative emotions" during STEM testing can do better on the tests — and the course. According to a paper published on the findings, by learning how to regulate their emotions, half as many students failed the course as a control group that didn't undergo those activities. The "large-scale" field test involving 1,175 students was conducted in ninth-grade science classrooms. During the school year, all of the participants did 10-minute writing exercises before their final exams in January and May and filled out a survey before they left school for the year. The writing exercises asked the students to do a reading they were told was written by scientists explaining how the "anxious arousal" they feel before a stressful event, such as a test, was "actually meant to be helpful instead of harmful." A control condition that instructed students to ignore symptoms of their stress and nervousness. The idea was to find out whether interventions that help students regulate their negative emotions during tests could reduce the achievement gap between higher- and lower-income students. Indeed, that's what happened. 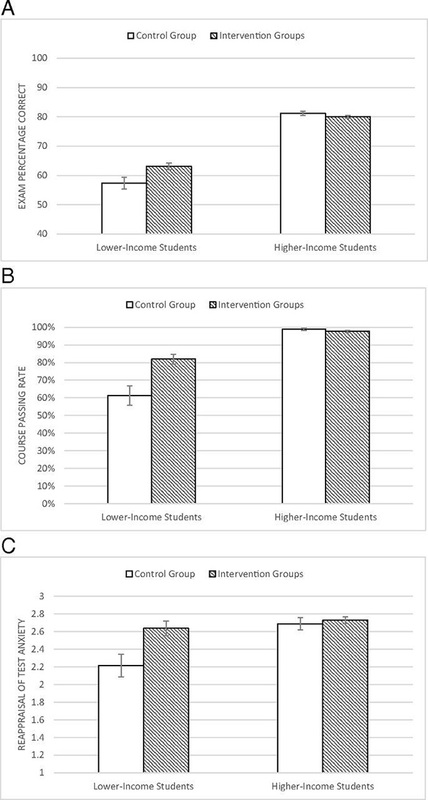 For example, 39 percent of lower-income students failed the course in the control group compared with only 18 percent of students failing the course if they participated in the emotion-regulation interventions. In other words, course failure was cut in half. The results were recently published by the Proceedings of the National Academy of Sciences. "Our work underscores the crucial importance of targeting students' emotions during impactful points in their academic trajectories for improving STEM preparedness and enhancing overall academic success," the researchers noted in their paper. The full paper is openly available on the PNAS website.